This is the story of a whole complex. Brookfield place, 250 Vesey st, American Express tower, 225 Liberty st, and now Brookfield Pavilion, compose a same and continuous design. Everything started back to the 1970’s, when series of competitions were organized to deal with the plot. Pelli Clarke Pelli architects were finally chosen to design the new complex for the World Financial Center, downtown NYC. When 9/11 happened, the architects were called back to deal with the major destructions that occurred. The elevated bridge was broke down (see below) and the glass façade of the towers behind were seriously damaged. Every glass panel had to be replaced as quick as possible to keep the place running. The created void in front of Winter Garden of Battery Park became a specific design project itself. Its first role was to recreate the lost connection between the Memorial and Battery Park. First intentions were for this place to become a public space. For budget reason, Brookfield became the project leader but this idea of community service is still at play. After 9/11, the idea of openness and transparency as a cultural reaction to the event became the intent of an architectural landmark. The project under construction eventually served as a mourning place for a lot of people, coming here to honor their loss. Yesterday October 12th, as an event of the great Archtober, the project team leader Craig Copeland from Pelli Clarke Pelli architects offered us a great tour of the place. A full report of the visit will sure appear on Archtober blog. As a foretaste, here are a few pics and comments. The two giant columns are the feature n°1 of the pavilion. The 1st and logical idea was to have simply 4 columns, one at each angle of the pavilion. This was not technically possible to build, as the pavilion is standing right above the World Trade Center bathtub, keeping away Hudson River waters. Thus only 2 columns were possible at the exact spots where the basket pillars – as they call it – are standing. T he two major hurdles of the project became the architectural expression of the structure and how to build it. This is how a technical constraint became an architectural element of expression and beauty. The columns are composed of very strong steel tubes, organized in inner and outer bunches, each going in opposite directions. You can see in the pictures above how the columns were built by sections at the workshop, where the structural forces could be precisely controlled, and then assembled on site. The cut from one section to another is purposely slightly shifted from the horizontal circling elements, in order to have a stronger structure and a better finish. These giant beautiful columns support the roof, which supports the glass curtain wall. The glass façade is literally hung like a curtain by a “point support system”. The glass is made in Germany and presents a very low emission rate, to avoid having too much UV rays coming in. Still, the openness is an asset for indoor temperature management. In winter the stone on the floor is heated by the sun through the glass and by a heating system underneath. We then went down to the underground court. The Brookfield pavilion is like a door leading to the tunnel crossing the memorial place underneath. 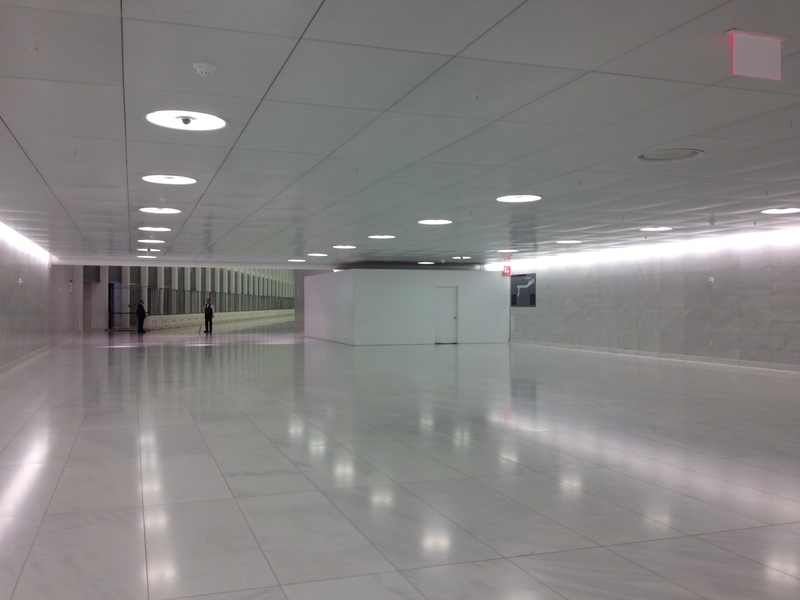 On the other side, the hub (designed by Calatrava and now under construction) will serve the subway. The space down the escalator and before entering the World Trade Center under-path was carefully designed to avoid anxiety. The height and the light gently lead you from the high luminous pavilion to the low-ceiling large court. Also, the walled stone is not similar but closely mimics the one of the court. When you come back up, what an impression the pavilion gets on you! You feel like “sucked up” by the sun from the glass façade, pulled up by the light playing with the basket columns. The main level of the Wolrd Trade Center before 9/11 was up to 20feet above the street level. The majestic stairs of the Battery Park Winter Garden were meant to go from the Hudson River shore level up to the bridge crossing the 9A road. A general willing for the whole neighborhood was to re-assess the main level to the ground level.The stairs were thus considered to be destroyed. But the community stood up and the design was to keep the stairs as they are. Consequently, the pavilion had to get the minimum height to enable a comfortable space up the stairs. The architects came up with this genuine mezzanine (see section below). On the other hand, the idea was to see light and sky as you were coming up from the tunnel. You can see on the section below that the height of the pavilion enables this additional glass stripe behind the column. All in all, this design is a jewelry: a structural feat, a meaningful architectural, a functional bridge. Thanks again to Craig Copeland for the tour and to Pelli Clarke Pelli for the story of Brookfield Place, an ongoing design.